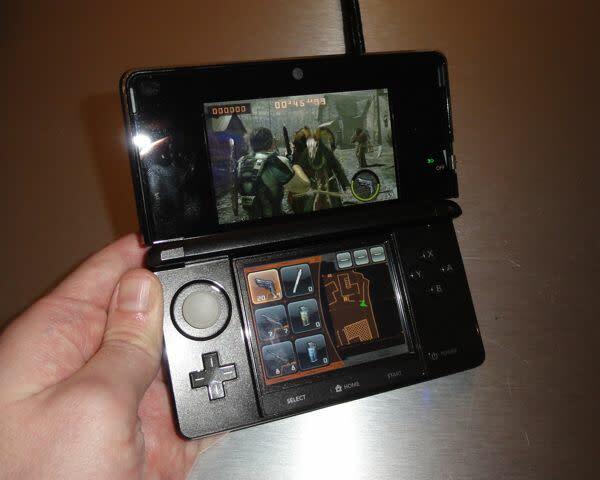 At last, I've had a chance to spend quality time with the 3DS, Nintendo's new glasses-free 3D handheld — and yes, it lives up to the hype, although I found that a little 3D on the 3DS's 3.53-inch display goes a long way. Slated to arrive in the U.S. on March 27 for $249, the 3DS looks pretty much like the DSi, complete with the usual dual displays, the DS slot, and the standard D-pad. 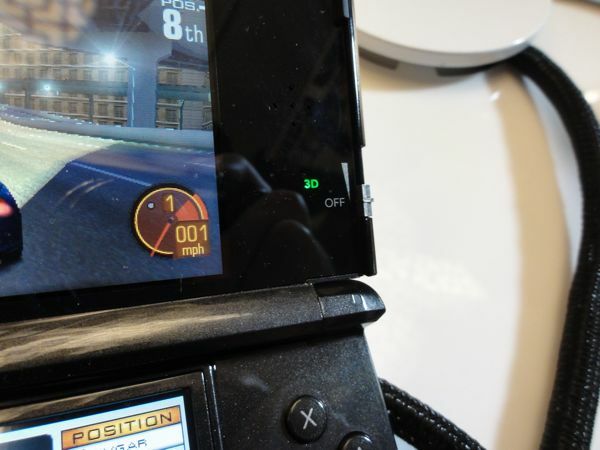 Of course, the feature we've all be waiting for is hinted at by the little 3D slider on the right side of the display, which controls the depth of the 3D image on the main 3DS; slide it all the way down for standard 2D, or all the way up for extreme, eye-crossing 3D. So, how does the 3D image look? For the most part, really good — far better than I was expecting, in fact. There's a real sense of depth to the image, with the action appearing to stretch well behind the screen. 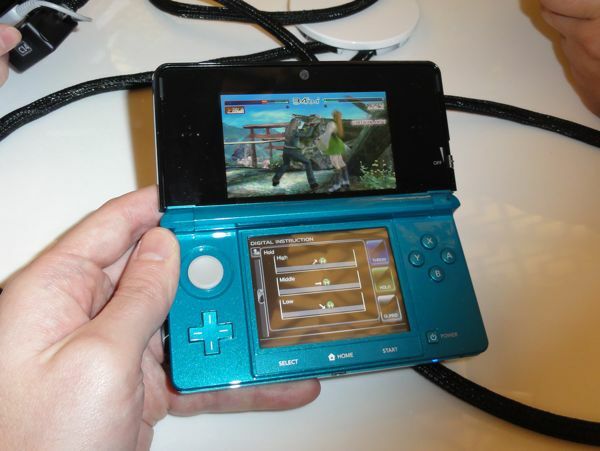 But view the 3DS from an angle — any angle — and the 3D effect falls apart, and the higher up you push the 3D slider, the more you'll feel like your eyes are starting to cross. I also noticed a second or two of double vision before my eyes adjusted to the 3D effect. 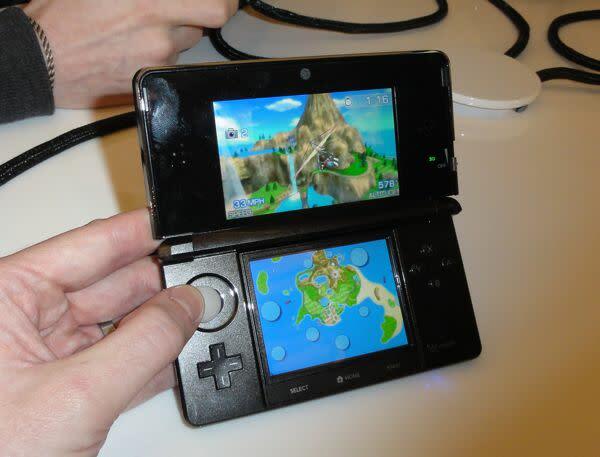 Nintendo reps had a few pretty 3D demos teed up before Wednesday's launch event; after the big announcement, though, the curtains on the side of the room opened to reveal demo stations where we could try a selection of 3D-enabled 3DS launch games. First up: Ridge Racer 3D, a typical racing game with such glorious 3D vistas that I had a tough time keeping my eyes on the road. The more you push the 3D slider control, the cooler the soaring cityscapes look; at the same time, though, I could feel a bit of eye strain when I had the 3D effect pushed too far. Easy does it. Next, I gave Dead or Alive: Dimensions a try, and again, the 3D effect looked great as I threw furious punches under a rushing waterfall. Still, it took some fiddling to get the right balance between a noticeable 3D effect and a setting comfortable enough for prolonged gaming, while a few isolated double-vision moments proved a bit distracting. Another interesting 3D title was Nintendo's first-party Pilotwings Resort, a casual flying game that lets you float around the Wii Sports resort village in a biplane, a hang glider, or a jet pack. Dialing up the 3D effect made the flight look pretty extraordinary, giving the hills and mountains an almost majestic look on the 3DS's relatively tiny 3.53-inch display. Nice, but the longer I flew around, the more I could feel the eye strain creeping in — and backing off the 3D effect turns Pilotwings Resort into a relatively tepid affair. Last but not least, I tried my hand at a little zombie killing in Resident Evil Mercenaries 3D, a game that might benefit the least from 3D — mainly because I was too busy staggering away from a hoard of bloodthirsty baddies to notice the new-found depth of the game's grimy world. 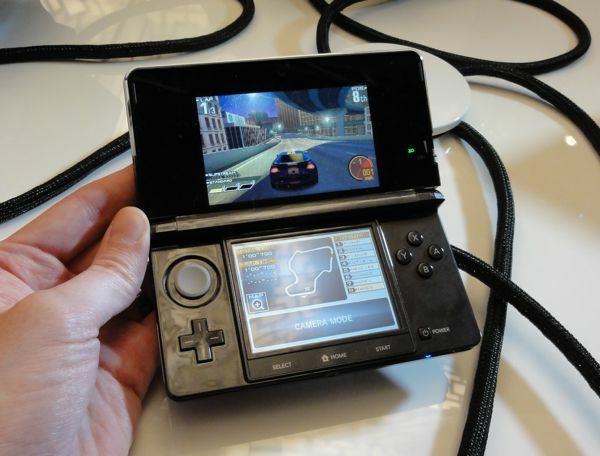 Nitpicks aside (and based on very limited testing, of course) I'd call the 3D display on the 3DS a success, and an impressive feat on Nintendo's part — although for gamers, the 3D effect will probably work best if used sparingly. The true test of the 3DS will only come, of course, once we've had the chance to game on the console for more than a few minutes at a time — and for that, we'll have to wait until March 27.